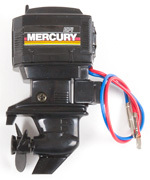 Modern outboard motor for open boats such as our Forelle or other types of model such as rescue boats and inflatable boats up to around 35 cm in length. The electric motor is cowled to protect it from water, and the system can be servo-operated or used in a fixed position defined by a ratchet. Supplied completely assembled, as shown in the illustration.